Workload can refer to the physical or mental effort required to carry out a task. Staffing level is concerned with ensuring the correct number and type of personnel are in post for all tasks. Why workload and staffing levels? High workload and inadequate staffing, and the effects these have on fatigue and decision making, have been cited as causes of major accidents. 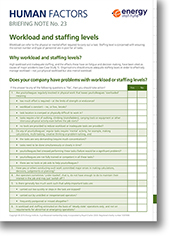 Organisations should ensure adequate staffing levels in order to effectively manage workload – not just physical workload but also mental workload.